Spar varnish gets its name from the wooden poles that support the sails on a marine vessel. 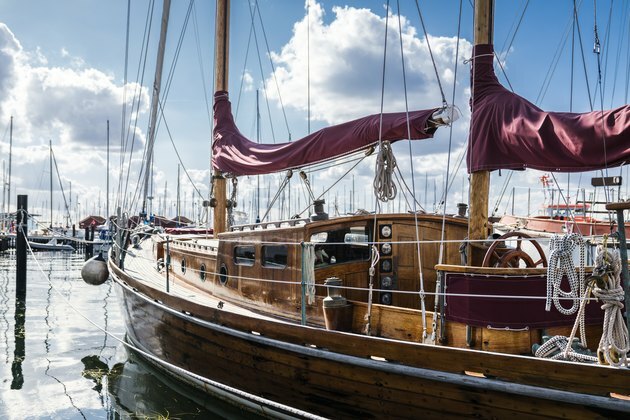 A ship's spars get exposed to an unusual amount of wind, sun and moisture, so spar varnish has to be more durable than regular varnish to last for any length of time. To this end, a traditional spar varnish contains a high ratio of resins to solvents. That not only gives it more body and makes the final finish harder, it also provides crucial protection from ultraviolet sunlight. Spar urethane, of which Minwax Helmsman is a leading brand, is spar varnish that includes urethane plastic as one of its resins. It's the go-to material for any exterior woodwork that needs a clear finish, but because its high resin content gives it a yellowish hue, it isn't the best choice for interior furniture. However, it's a great finish for any woodwork that is exposed to moisture regularly, such as a bar, countertop or shower seat. What Makes a Varnish a Varnish? The woodworker's universe includes two broad classes of clear finish: Penetrating oils and film finishes. Varnish is an example of the latter class, but it's different from other film finishes, such as lacquer and shellac, that simply leave a transparent coating after the solvent dissolves. A varnish contains a polymer that undergoes an irreversible cross-link reaction with the atmosphere to harden permanently. In other words, it cures and once it turns hard, it won't soften again when you add solvent. The polymer in traditional varnishes is a plant alkyd, but contemporary formulations replace this with urethane, which is a synthetic plastic. Usually, it's mixed with linseed oil and mineral spirits or a similar solvent. Spar varnish differs from regular varnish in two ways. It contains a higher concentration of solvents, and it contains additives to disperse ultraviolet light. You can find spar varnish at Lowe's, Home Depot, Menard's and other building supply outlets. When the product is formulated with urethane, it will probably be labeled spar urethane. Minwax Helmsman is a popular brand. You'll find it on the shelf next to Cabot Marine Spar Varnish, which isn't formulated with urethane. You don't use spar urethane or spar varnish any differently than you would any other varnish. Because of the thicker consistency of spar varnish and urethane, however, they usually take longer to dry than conventional varnish, so you have to wait longer between coats. In most cases, you'll want to apply spar urethane with a brush. It's a little too thick for spraying, although you can thin it if spraying is the best option. The surface to be varnished must be clean and dry, and the ambient temperature should be above 50 degrees Fahrenheit. Avoid visible brush strokes by brushing with the grain of the wood – never cross-grain. You can layer multiple coats of spar urethane on top of each other, and you can apply it over an existing finish. To ensure adhesion, you should always scuff old finishes or undercoats of spar urethane with 150-grit sandpaper before applying a fresh coat of spar urethane. Can You Tung Oil Over Urethane?